Patients | Uimpl. Dental implants, implantation rates. Dental implants – a term which appeared recently, but rapidly and steadily becoming more popular. In many patients the word “implantation” causing fear through the stereotypes that have developed since the first attempts at implantation. Nowadays, modern technology took over almost everything and implantation is no exception. 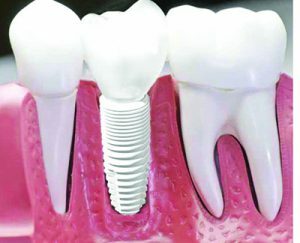 Modern dental implants are made from high quality titanium, which combines the strength of steel and the ease of aluminum, and it developed hydrophilic surface contributes to rapid osseointegration, ie engraftment to the bone, which excludes from its fragility time after installing the implant as it becomes part of the bone. The installation procedure of the implant into the bone completely painless and takes 15 to 40 minutes. Modern anesthetics have strong analgesic effect, and if desired, the patient and the absence of contraindications, manipulation can be performed under general anesthesia. Period engraftment of the implant to the bone is from 3 to 6 months, during which time the patient is in any case not remain without teeth. During engraftment, in place of the missing tooth, put a temporary structure. 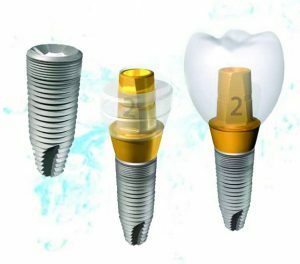 After the period of osseointegration the implant is installed crown, which operates both practical and aesthetically pleasing, fully anatomically corresponding qualities of healthy tooth.